We understand your passion for travel and realize your travel needs are as individual as you. So we provide more membership choices for all-inclusive travel support. We take the worry out of traveling and offer convenient concierge to free up your time. Choose from Gold, Platinum and Platinum Plus levels, each including emergency roadside assistance and concierge services that you can use both on, and off, the road. We’ll guide you to the best campsites, make your dinner reservations and refer you to exciting, local activities. We’ll even deliver your RV to you, help you find the lowest price gas stations and more. Worldwide travel assistance and medical assistance are available for expanded travel protection. Each plan is comprehensive, with 24/7 technical assistance from our staff of RVIA/RVDA and ASE Certified Technicians who speak directly with you to troubleshoot operational issues. Should you need emergency roadside assistance, our vast network of service providers offers a wide range of services to handle the special needs of your RV. Priority RV Road Care’s Tech Advantage is the only technical assistance program with RVIA/RVDA and ASE Certified Technicians on-staff to help you resolve common technical problems you may encounter with your RV. In unfamiliar territory, where do you go for service should the need arise? We’ll notify the closest, qualified service facility, discuss your situation with the appropriate contacts and make your appointment. Priority RV Road Care has the largest RV technical and emergency roadside assistance network in the United States and Canada, with more than 40,000 service providers and repair facilities to meet your needs. We follow up on the service provider’s estimated time of arrival and rate service provider performance in order to deliver the best service experience possible. In some situations, Priority RV Road Care will dispatch a mobile mechanic to attempt an on-site remedy. In this event, Priority RV Road Care will pay for the service call to send the mobile mechanic to you (on-site labor and parts extra). 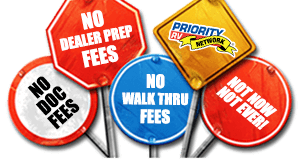 Every Priority RV Road Care membership includes concierge services. The type of benefits you receive depends on the membership lever you choose. We’re here for you. If you need it, we’ll find it. Let us do all the work while you focus on enjoying your travels. Priority RV Road Care concierge services will help simplify your day. It’s like having your own personal assistant to handle your errands and guide you to the best places during your travels. Platinum expands Gold benefits with a 24-hour travel hotline for emergency and last-minute travel assistance. Platinum Plus members receive dispatch of medical personnel anywhere in the world, 24 hours a day, as well as assistance with travel outside of the United States and Canada, in addition to Gold and Platinum benefits.